On February 3, 1911, California Governor Hiram Johnson made the flag the official State Flag of California, although the original had been around since 1846. That year, Californian rebels led what became known as the "Bear Flag Revolt" in the early years of the Mexican-American Wars (1846-1848) and designed a flag for their cause. 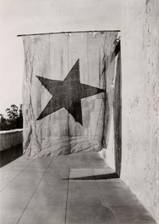 It was designed by William Todd, a cousin of Mary Todd Lincoln, Abraham Lincoln's wife, and the Todd Flag (us-ca46.html) was first flown in Sonoma, California. Legend says it was made from a piece of cotton cloth and flannel borrowed from a ladies petticoat or man's long underwear, but we'll never know, because the original was destroyed in 1906, during the San Francisco earthquake and fire. Colors: The following color references are those of the Textile Color Card Association of the United States, Inc., New York; the colors on the flag are to be substantially the same as these color references. White--of the white field, front of bear's eye, and on the bear's claws is White, cable number 70001. Red--of the red stripe, the star, and the bear's tongue is Old Glory, cable number 70180. Green--of the grass plot is Irish Green, cable number 70168. Brown--of the bear is Maple Sugar, cable number 70129. Dark brown--of the bear outline, paws, shading, fur undulations, iris of the eye, the 12 grass tufts in the grass plot, and the letters is Seal, cable number 70108. I thought this flag interesting because it explains where the red star on the California Republic Bear flag and John Sutter's flag and may have come from. This image is based on a museum photo from the Southwest Museum in Pasadena. More details on Alvarado Flag page.